Who created Pac Man? The name of the person credited with inventing Pac Man is Toru Iwatani (1955 - Present). The iconic arcade game was released by Japanese video game company Namco. Toru Iwatani is not only famous as the Japanese inventor of Pac Man but also as a computer software engineer and video game designer. When was Pac Man created? Toru Iwatani created Pac Man in 1980, during the Technology and Information Age of inventions. Definition of Pac Man: Pac Man is defined as an arcade video game in which a player moves through a series of mazes, with various obstacles, ghosts and enemies, eating pac-dots, also called biscuits or just dots. When all pac-dots have been eaten, Pac-Man is taken to the next stage. Fact 1: Who created Pac Man? Pac Man was created by Toru Iwatani in 1980 during the Technology and Information Age of inventions. Fact 2: Who created Pac Man? Prior to the invention of Pac Man in 1980, other popular arcade games like Space Invaders and Space Asteroids had achieved success with young boys and teenagers. Pac Man was different. It gained a much wider audience because it appealed to all ages and both sexes. Fact 3: Who created Pac Man? The inventor of Pac Man, Toru Iwatani, was born on January 25, 1955 in Meguro, Tokyo, Japan. Fact 4: Who created Pac Man? The early years of Toru Iwatani were spent in Meguro, Tokyo, Japan where he was raised by his family. Toru Iwatani was educated at college in Tokyo but taught himself subjects relating to computer technology. Fact 5: Who created Pac Man? As a child Toru Iwatani, like most Japanese youngsters loved reading 'manga', a style of Japanese comic books and cartoon strips that were enjoyed by both adults and children. Manga is characterized by a highly stylized art and this would later influence Toru Iwatani in the style, colors and design of the Pac Man game and would become an icon of 1980s popular culture. Fact 6: Who created Pac Man? Following his education Toru Iwatani gained a position with the computer software company Namco and became involved with the design of video arcade games. Video arcades, or amusement arcades were extremely popular venues. In 1978 Space Invaders was released and Atari's Asteroids was released in 1979, both games were massive hits at arcades, especially with the young boys and teenagers. The new arcade games revolutionized the gaming industry. Fact 7: Who created Pac Man? Namco developed the arcade game Galaxian in 1979 which was designed to compete with the success of Space Invaders. Galaxian was a fixed shooter game involving spaceships and shooting enemies, once again targetting the market of boys and male teenagers. Fact 8: Who created Pac Man? Toru Iwatani realized that there was a gap in the market for an arcade game that had a wider appeal and would be enjoyed by gamers of all ages and both sexes. Fact 9: Who created Pac Man? The idea seemed highly logical and could be made into a great money spinner. Toru Iwatani began to look for inspiration for the format of the game. His inspiration came when it was most unexpected - at a pizza parlor of all places. Fact 10: Who created Pac Man? Having been served with a pizza pie he cut himself a slice and noticed that when he removed one piece, it looked like a mouth. His child hood passion for manga and animation made him realize that he could create a simple, cute icon that could munch on food. Fact 11: Who created Pac Man? His idea was to have the bright yellow icon, which he called 'Paku' from the Japanese word meaning "chomp", making its way through a maze eating power cookies or biscuits along the way enabling 'Paku' or 'Puckman' to defeat his enemies. This idea was inspired by another favorite cartoon character, Popeye, who ate spinach to give him strength to defeat his arch enemy Bluto. Fact 12: Who created Pac Man? The game developers at Namco worked in small teams and Toru Iwatani put his idea to a programmer called Shigeo Funaki and a sound and music developer called Toshio Kai to work with him on the project. Fact 13: Who created Pac Man? The manga inspired graphics were cute and simple with vibrant colors. Toru Iwatani decided that the 'enemies' should be referred to as "ghosts" that each used different tactics against 'Puckman'. The name 'Puckman' was later changed to 'Pac Man' to suit Western audiences. Fact 14: Who created Pac Man? The four enemies or ghosts in Pac Man had the names of Blinky, Pinky, Inky and Clyde. What are the color of the ghosts in Pac man? Obviously Pinky was the pink ghost, Inky was the blue ghost, Blinky was the name of the red ghost and Clyde was the name of the orange ghost. Fact 15: Who created Pac Man? All of the ghosts roamed the maze, trying to catch Pac Man. 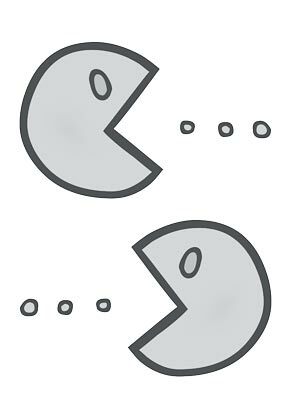 Blinky, the red ghost, was first to appear shadowing Pac Man and making sneak charges against the character. Pinky, the pink second ghost was the speedy ambusher. Inky, the dangerous blue ghost, made surprise attacks and Clyde, the orange ghost, was often the last to appear and adopted the strategy of random attack. Fact 16: Who created Pac Man? Additional bonus food to the power cookies were made available to Pac Man in the shape of fruits and other icons. Points were awarded as Pac Man chomped his way through the maze. The power cookies, often referred to as pac-dots were worth 10 points, Power Pellets, flashing dots best known as energizers were worth 50 points, Cherry: 100 points, Strawberry: 300 points, Orange: 500 points, Apple: 700 points, Melon: 1000 points, Galaxian Boss: 2000 points, the Bell: 3000 points and the Key: 5000 points. Fact 17: Who created Pac Man? The player controlled Pac Man as he chomped his way through the maze, and when the 244 pac-dots were eaten the player moved to the next stage. Fact 18: Who created Pac Man? Pac Man became an instant success, a global phenomena, that is still one of the most recognized video game characters of all time. Fact 18: Who created Pac Man? Toru Iwatani met his objective of creating a game that appealed to boys, girls, and men and women of all ages. He was promoted at Namco and 27 years later, in 2007, he developed the Pac Man Championship Edition for the Xbox 360. Fact 18: Who created Pac Man? Toru Iwatani left Namco in 2007 to become a full-time lecturer at Tokyo Polytechnic University. Fact 18: Who created Pac Man? The 2015 movie 'Pixels' featured computer animated video game characters including Pac Man. Toru Iwatani made a cameo appearance in the movie as a repairman of classic arcade game machines. Who Created Pac Man - Toru Iwatani - Inventor - Invention - Definition - Meaning - Famous - Important - Pac Man History - Innovation - Significant - Development - Toys and Games - First - Pac Man Game - Definition - Kids - Facts - Information - Info - Who created Pac Man - Dates - Pac Man Game - When - Why - Impact - Purpose - Use - Pac Man Game - New - Old - Amazing - Best - Pac Man Definition - Meaning - Awesome - Cool - Japanese - History - Who Created Pac Man?